Hair straightening solutions have certainly come of age! This method of hair straightening changes the internal structure of the hair strand so that it gives a permanent straight result. Once the straightening solutions and processes have been completed the hair is permanently altered. The permanent straightening system we use is gentle on the hair but effective to give hair a straight sleek look. 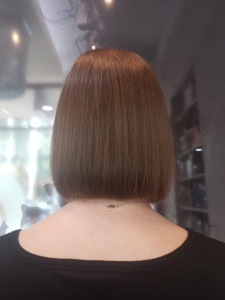 Permanent straightening is a reasonably involved service suitable for many types of hair but requires an in-salon consultation. Like all chemical treatments on hair, this permanent hair straightening should be supported with the recommended aftercare to maintain beautiful healthy straight hair. Typically only the roots or regrowth need touching up after about 4-6 months depending on your hair type, health and how quickly your hair grows. You can read more detail about the process of Permanent Hair Straightening on this page and FAQ’s. There is a lot of mis-information about Keratin treatments. 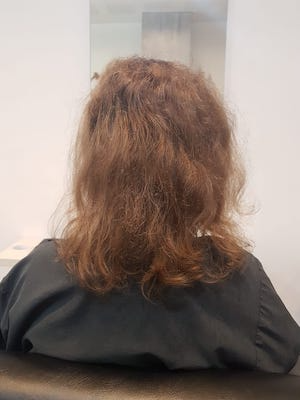 You should consider a Keratin service as a Hair Smoothing Treatment and not a straightening – they are a non-permanent hair treatment that can be equally effective at reducing frizz and reducing styling times. The hair is coated with a Keratin solution (keratin is the protein found in hair) which is then bonded to the hair cuticle using heat from hair dryer and from straightening irons. Keratin treatments help smooth wavy and frizzy hair hence giving an end result of straightening the hair. Keratin Treatments can also help recondition the hair and restore shine. The hair structure is not altered. The treatment is heat activated. This means that the best de-frizz and smoothing results are obtained when you blowdry your hair. Keratin Treatments typically reduce the amount of time it takes to blowdry/style your hair. Typically treatments last between 8-20 weeks with the results tending to improve with each successive treatment. 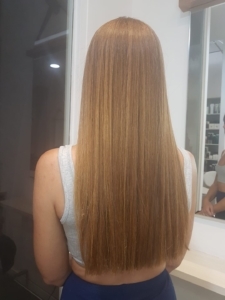 Read more about our Sydney hair straightening services using keratin treatments. The only way we can provide you with information on pricing is to call us to book in for a complimentary consultation on 9360 8708 at our salon in Darlinghurst, Sydney, so that we may correctly assess your hair.